Care leaders in a London borough where a teenager was groomed and shot dead have "neglected their duties" to children, an inspection found. 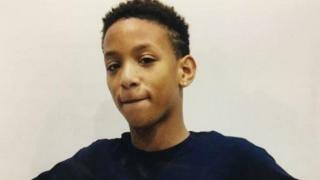 Corey Junior Davis, 14, was killed in Newham, east London, in September 2017, despite his mother warning social services he was at risk. A snap Ofsted inspection found social work had "deteriorated significantly" in the borough since 2014. Newham Council said an improvement plan was in place. Corey was treated like a criminal when he told authorities he felt unsafe, his mother previously said. A serious case review found the teenager had been groomed by gangs from the age of 13. The Ofsted report published on Monday found young people at risk of exploitation were "not always effectively identified, and protective action [was] not consistently instigated to safeguard children". Inspectors said there were examples where police started interviews with children without a social worker present, which meant some young people had to relive distressing experiences. Case loads were also found to be "too high in several teams to enable good social work". Since the department was rated as "requiring improvement" in a 2014 inspection, there "has been a lack of child focus by leaders," the report states. "[This] means that the standard of social work practice in Newham has deteriorated significantly." The latest report rated the service "inadequate". Speaking to the Local Democracy Reporting Service, Corey's mother Keisha McLeod said she was "not surprised" by the rating. She said: "My experience was that there was some people there who just did not seem to care. I always felt like I was fighting an uphill battle for my son. "I could tell they were overworked but we were made to feel like a nuisance when we were asking for help. "I hope this Ofsted report forces changes so other families do not have to go through what we have." Newham Council said it had already started addressing the points made in the report. Fran Pearson, chair of Newham Safeguarding Children Board, said: "As safeguarding partners we take some comfort in that the Ofsted inspectors identified no systemic failures in child protection and safeguarding, which is our main priority." Newham's mayor Rokhsana Fiaz, who was elected in May 2018, apologised "unreservedly" for the failings, adding: "It's clear that services have not been good enough."